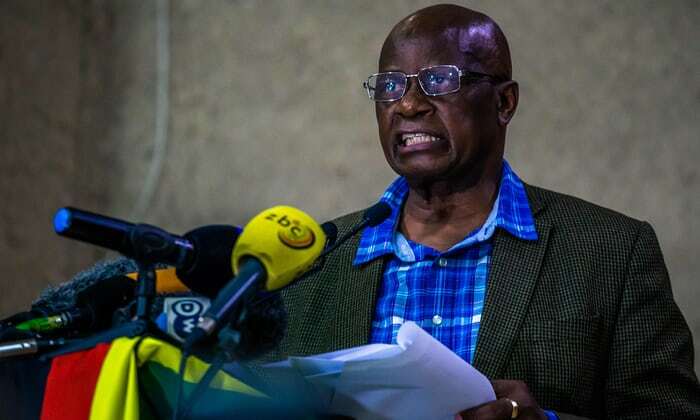 Only two seating Members of Parliament in Manicaland Province are guaranteed of progressing to the do-or-die general elections to be held in July this year after their respective constituencies could not attract challengers in the Zanu-PF primary polls, the Eastern News reported. Manicaland has a total of 27 constituencies. Two candidates, namely charismatic security guard-turned politician Joseph Chinotimba and businessman William Mutomba are progressing to the next stage without raising a sweat in the primaries to be held on Sunday. The rest of the constituencies are being heavily contested for, with observers not ruling out surprises. Born April 6, 1956, Mutomba, who worked in the President's Office between 1982 and 1984, and rose to fame through the Shoppa Stoppa supermarket brand, will stand uncontested in Buhera North, while Chinotimba is a shoo-in for Buhera South. Besides these two, it is fair game for the rest of the constituencies. Two Cabinet ministers face an uncertain future after their National Assembly seats excited interest from competitors. In Makoni Central, Finance and Economic Development minister Patrick Chinamasa is being challenged by one Shadreck Mavhundutse. Information Communication Technologies and Cyber Security minister Supa Mandiwanzira will be fighting to retain the Nyanga South seat, which he won from the opposition MDC in the 2013 elections, when he made the decision to go into politics. Many are tipping Mandiwanzira to sail through on account of the many community projects that he has rolled out in Nyanga South. Many will, however, be following the poll contest with interest to see if Talent Kudzima is capable of staging a giant-killing act in Nyanga South. In the unlikely event that Mandiwanzira and Chinamasa fail to pull through, their future in Cabinet will become hinged on the benevolence of the head of State and government to emerge out of the July/August presidential race, who, according to the law, has the prerogative to appoint five non-constituency MPs. The rest of the political heavyweights in Manicaland, among them Zanu-PF national chairperson Oppah Muchinguri-Kashiri, are eyeing senatorial seats. A technocrat has entered the race in Mutasa Central, after many years of dithering on his chances of going into politics. Jefta Sakupwanya, the chief executive officer of the Zimbabwe National Water Authority will take on Tendai Anthony Chinamasa, a relative of the Finance minister whom he ironically shares the same middle name (Anthony) with. Provincial chairperson Michael Madiro, faces a stern test from Batsirai Pamhenai, son of Charles Pemhenai — a former legislator for the constituency — who died in a mysterious car accident in July 2009 and was buried at the provincial shrine. Two other contestants will be running for the seat namely John Netsiyamwa and July Manyewu. In Mutare South, former minister of Women's Affairs, Gender and Community Development Nyasha Chikwinya faces a litmus test, with five other candidates aspiring for the seat in the primaries. Among the five candidates is Freddy Kanzama, a former Member of Parliament for the constituency, whose star was dimmed during former president Robert Mugabe's era when he was side-lined on suspicion of hobnobbing with former vice president Joice Mujuru, who now leads the National People's Party. The other aspiring candidates for Mutare South are Jeffrey Ngome, Wilson Makangadze, Charles Rafemoyo, Godfrey Chikosi and Gilford Saduma. In Mutare South, Shellington Bumbura will take on career politician Irene Zindi. In Makoni South, Harare lawyer and technocrat Misheck Mataranyika feels hard-done after his name was struck off from those of aspiring candidates. The constituency has a five-horse race in which Happiness Nyakuedzwa is leading the race, but faces competition from Josephine Gandiya, Jairos Mapungwana, Masimba Chiganze and Innocent Chirambahumwe. Oliver Mandipaka, Soul Nzuma, Wilson Nzuma, Gelly Miti, Aaron Mupandawana, Prosper Nyawo. Jeffrey Ngome, Nyasha Chikwinya, Wilson Makangadze, Freddy Kanzama, Charles Rafemoyo, Godfrey Chikosi and Gilford Saduma. Christopher Chingosho, Kuchinei David Muzarabani, H Matombo, Esau Njekera, Reedempter Gwasira, Moses Chikwariro, Taurai Chiripamberi. Joshua Kurt Sacco, Batsirayi Mahwende, Anthony Machingauta, Edmore Siwela Dumisani, Phenias Gwiza. Thabani Dube, Nokuthula Matsikinyere, Kevin Macherenje, Jona Muchayi. Josephine Gandiya, Happiness Nyakuedzwa, Jairos Mapungwana, Masimba Chigadze, Innocent Chirambahumwe. Joseph Mujati, Jennifani Muswere, Sarapiya Makuyahundi, Nation Madongorere, Peter Zindi, Roland Madondo, Mativenga Mhiripiri, Chengetai Zonke, Romeo Mutsvunguma. Isau Fungai Mupfumi, Wada Munjoma, Mike Reketai Duru, Portia Zvitambo, Kenneth Muchina, Enos Chimeri, Kenny Mutombeni, Binali Yard. Christopher Mushowe, Teedzai Percy Muchimwe, Maxwell Hatiponi Marangwanda, Maxwell Marange Masanga.